Rae Brothers operated from a factory located at 27 Milton Street in Mackay from about 1933 till it was sold to C.F. McLennan and Co. in 1939. The brothers then went west and operated a cordial factory in Finch Hatton until about 1945. 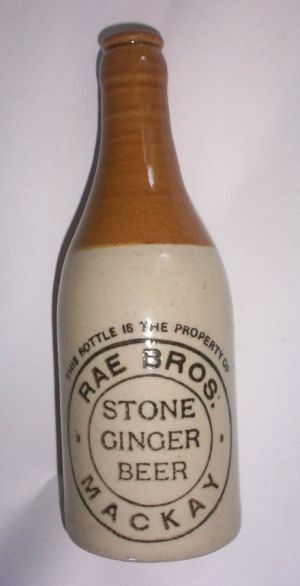 An example of a Rae brothers Stone Ginger Beer Champagne neck bottle. Another example of a Rae brothers Stone Ginger Beer Champagne neck bottle with the blue glazing. 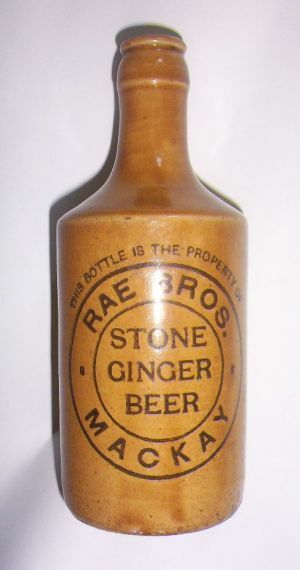 example of a Rae brothers Stone Ginger Beer Dump bottle. An example of a Rae brothers glass crown seal with embossed horses head on the glass.